Conveniently located on the main promenade stretch, the SEA LIFE Blackpool is the perfect respite from the unpredictable February half term weather. SEA LIFE Blackpool is open daily between 10am-5pm. Launching on Saturday 13th February 2016, SEA LIFE Blackpool will be launching Jurassic Seas, a new family experience that takes visitors on a trip back in time, to an underwater graveyard of the great pre-historic beasts of the ocean. Visitors will walk through the skeletal remains of the once great beasts of the sea and meet the weird and wonderful creatures that have outlived the dinosaurs. Enter the sea graveyard to learn about evolution and explore an exhibit filled with mysterious Mudskippers, Horseshoe Crabs and other unusual creatures that lived in pre-historic times. Those who are brave enough can meet the mighty Plesiosaurus, one of the deadliest creatures that swam the pre-historic seas – in an exciting new virtual game where you’ll take full control. This new, fun and educational experience is perfect for keeping the whole family entertained over February Half Term. 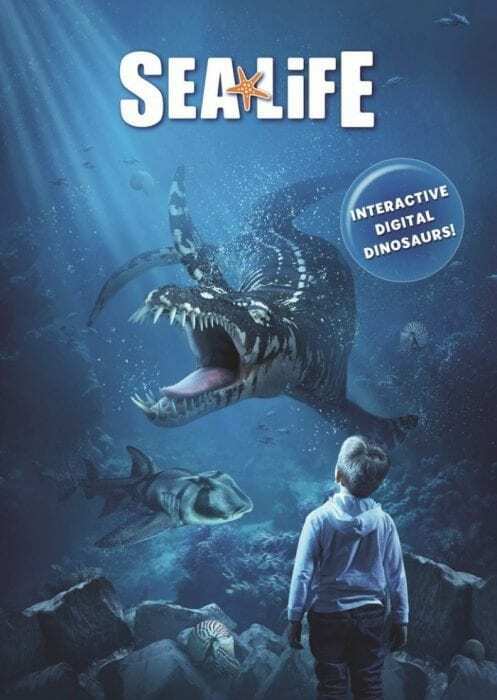 Sim’s Life is giving one reader the chance to win a family ticket to visit SEA LIFE Blackpool and experience Jurassic Seas and all the other wonderful sea creatures at the centre. To enter the giveaway for a SEA LIFE Blackpool Family Ticket, which entitles 4 people to visit the centre, simply use the Gleam form below and make sure to leave a blog comment! Giveaway ends at midnight 28th February 2016. One winning entry will be drawn at random by Gleam. The winner will be notified within 48 hours of the giveaway ending. The winner will receive 1 x Family Ticket to SEA LIFE Blackpool. The prize is non-refundable and no cash alternative will be offered. I would be a sea turtle, so I could ride the waves and travel about a bit. I would be a Jellyfish. They are so graceful. I could watch them for hours. I’d be a Starfish because they’re so beautiful and i’d never have to worry about getting injured as they can regenerate, so if i lose a leg i just grow one back lol…..perfect!! I’d be a dolphin, as they are very intelligent! I would be a seahorse because I’ve always thought that they look pretty. I’d want to be a barreleye, easily the most amazing looking creating under the sea. There’s just something intrinsically cool about having tubular eyes set in a transparent head and it looks like nothing else on this planet. A Queen Angelfish, Shes brightly coloured, showy and lives in the warm waters of the coral reefs. Shark, top predator in the ocean! I would be an Octopus so that I could make use of having 8 hands!!! I would want to be a Seahorse because they look so mythical. Would have to be a dolphin. Killer Whale. Something you would orca see before you die. I’d like to be a dolphin as I’m quite sociable and friendly and would like to bob about the ocean with my friends being all loveable! I’d be a seahorse for the simple reason they’re just so cute! I would be a turtle because how cool are they? I’d be a dolphin. They are so intelligent and graceful. I would be a dolphin as I enjoy all the tricks that they can do and they are very intelligent. I would be an octopus, because they are clever and beautiful. A starfish because of their cool shape! I’d like to be a humpback whale. Such beautiful creatures. Sea horse because they’re so adorable! A Seahorse because I just think they look relaxed and the females don’t have their babies, the males do! A seal so I could sunbathe on rocks all day! A seahorse, they are beautiful creatures. Dolphin, they are lovely creatures. Seem so friendly the way they communicate with each other. Also it seems people enjoy swimming with dolphins, and believe it is beneficial for Wellbeing. A dolphin, they always look so happy. I would be an Octopus because al those extra arms would certainly help with multi-tasking. Definitely a Ray, so graceful. I’d be a dolphin, beautiful & smart. What more could I ask for. an octopus. ..with 3 kids under 5 all moving in different directions I could do with a few extra hands! A Blue tang fish like Dory as I’m forgetful! Probably a shark, since they are the apex predators and have little to fear. Seahorse, no pregnancies and tethered by my tail can just watch the sea world pass me by! I would be a whale:( because I am huge. A dolphin. They always seem to have lots of fun! I would be an orca, they have such amazing grace for their size, and they’re my daughters favourite sea creature. I would be an octopus because I never have enough hands. I’d be a shark as I’d love the kudos! I would like to be an octopus because the extra hands would come in handy. I would be a turtle, then when things get a bit much I can hide away in my shell. A sea horse, so graceful! A dolphin. They’re such friendly creatures and they always have a big smile on their faces. Some kind of bottom dweller like a Stonefish. The sort of creature that only exists to cause people misery lol.